The bluebell native to Scotland (Hyacinthoides non-scripta) flowers from April to June. The flowers are always blue, with 6 bell-shaped lobes that curl back fully. The native bluebell is sometimes confused with the Spanish bluebell (Hyacinthoides hispanica). The two species may hybridise in places where the parent species grow close together. 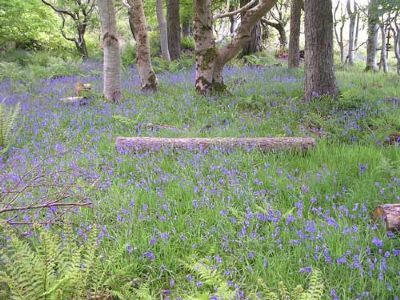 Central Scotland Forest Trust - Alarm bells for Bluebells or downloading their information sheet, here. Sow seeds from September to March. Scatter a packet of seeds over roughly one square metre of moist, well drained soil. Bluebells like dappled shade. Plants take 2 - 4 years to mature. Their distinctive deep blue colour and gorgeous, subtle fragrance is well worth the wait. Bluebell seeds are poisonous. Wash your hands after touching them. Bluebells are protected through general provisions in the Wildlife and Countryside 1981. This means it is illegal to intentionally uproot a wild plant or to sell or offer bluebells for sale. Eddie Scott has a licence from the Scottish Government which allows legal harvesting of seed for sale from Hyacinthoides non-scripta plants on his croft in Cleadale.